Miami Blossom presents itself in a completely new bottle with the same form as its predecessors. On the other hand, its color is completely new. More sunny than ever, the gradient changes from yellow to dazzling pink. The little pineapple decorates the whole under his name to suggest what is the main ingredient of this new composition. On the neck of this fruit are also attached small flowers tiaras, evoking exoticism and the sun. Miami Blossom is wrapped in a cardboard box with a woman’s silhouette. Thanks to the pale pink dress fluttering in the wind and the yellow hat, the latter looks oddly like the colors of the Miami Blossom bottle. His cheerful silhouette stands out from the more urban side. You understand, this is Miami! The visualization is signed by artist Yordanka Poleganova, and Miami Blossom comes in three different sizes of 30, 50 and 100 ml. Miami Blossom is a “sparkling summer cocktail with tropical elegance”. If the last Sorbetto Rosso from 2018 presented the scent of a watermelon, this time with Miami Blossom it is the pineapple that is in the spotlight. The result is a very colorful scent, dominated by sweet, juicy and spicy agreement. This exotic tropical fruit is surrounded by white flowers. 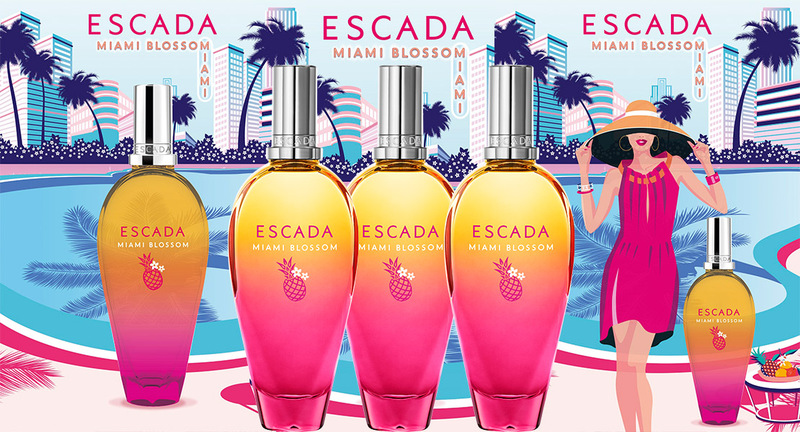 Miami Blossom d’Escada reveals its femininity in combination of tiare flower, jasmine and tuberose. Watermelon and orange give it freshness and make it a perfect summer fragrance. Finally, for greater depth, Miami Blossom ends with a duet of sandalwood and musk. 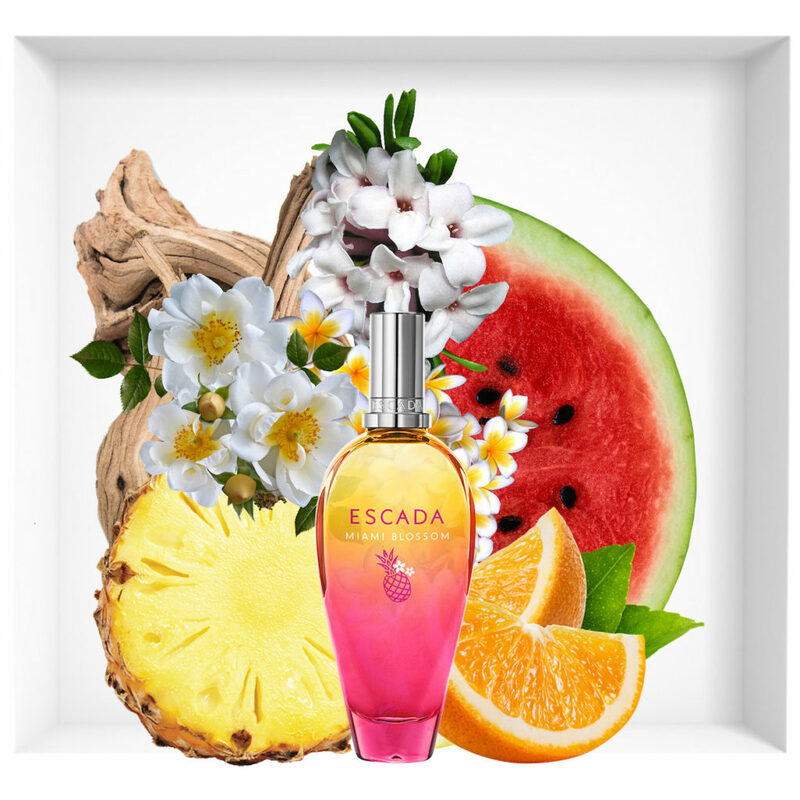 Created by Caroline Sabas, this essence is “the result of a fresh and flowery vision of femininity, transmitting energy, both light and juicy, as is the Escada signature”.